The aim of this study was to compare the diagnostic values of two methods in pork meat quality evaluation, that is, Method I: pH1 and pH24 and Method II: electrical conductivity (EC2) and pH24, which included pH24, and their modifications, that is, Method III: pH1 and pH48 and Method IV: EC2 and pH48, which included pH48 measurement. 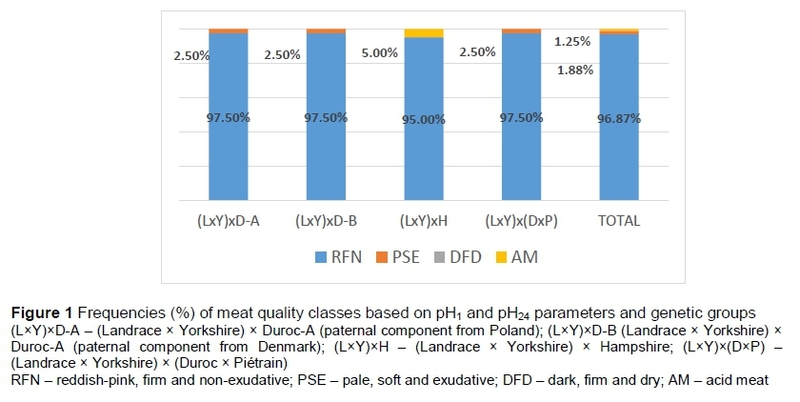 Five meat quality classes, namely reddish-pink, firm and non-exudative (RFN), high quality (HQ), pale, soft and exudative (PSE), dark, firm and dry (DFD) and acid meat (AM) were assessed in four even-numbered genetic groups of 40 fatteners each, namely (LxY)xD-A, (LxY)xD-EB, (LxY)xH and (LxY)x(DxP). The change of diagnostic method and therefore pH time measurement from 24 hours to 48 hours post mortem caused a major increase in the percentage of acid meat (AM) that was diagnosed. Most differences were observed in (LxY)xH fatteners, namely 77.5% between Methods I and III and 75% between Methods II and IV. This increase in AM frequency indicates that as a result of significant changes in the post-mortem metabolism that occur in the meat ageing process pH48 should be regarded as ultimate pH (pHu). Since the second half of the twentieth century, meat consumption has been increasing worldwide (Valsta et al., 2005) and a further annual increase of 1.4% is expected until 2024 (OECD-FAO, 2015). In Europe, the rise in meat consumption is related mainly to so-called fresh, that is, unprocessed meat (Breidenstein & Williams, 1987; Deutscher Fleisch-Verband, 2003; Alcalde et al., 2013). However, a major increase in lean meat content and fattening traits of pigs in the past 60 years has caused a deterioration in pork meat quality (Przybylski et al., 2012). Moreover, modern consumers attach excessive importance to the quality of purchased products, regardless of the strict monitoring of product quality that is implemented by pork processors nowadays (Verbeke et al., 2007). Additionally, meat processors and consumers suffer major financial losses owing to meat quality defects such as bright colour and increased drip loss (Fischer, 2007; Otto et al., 2007). Additionally, modern pig breeding has resulted in major changes in the meat ageing process such as the time at which ultimate pH (pHu) is fully achieved (see, inter alia, Zybert et al., 2008). This seems to be an important topic because of the effect of the post-mortem pH decline and extent in meat on its overall quality, among others water holding capacity (WHC) (Schäfer et al., 2002), drip loss (Fischer, 2007), protein structure (Huff-Lonergan & Lonergan, 2005) and shelf-life (Blixt & Borch, 2002). Although diagnostic methods of assessing pork meat quality use parameters that are measured up to 24 hours post mortem (such as pH value) and differentiate between reddish-pink, firm and non-exudative (RFN) meat and faulty meat such as pale, soft and exudative (PSE) and dark, firm and dry (DFD) meat (Kocwin-Podsiadta et al., 2006), because of recent changes in pig genotypes an assessment of acid meat (AM) is required. EC2 and pH24, which included pH24, and their modifications, that is, Method III: pH1 and pH48 and Method IV: EC2 and pH48, which included pH48 measurement. The research was carried out on 160 pigs during the fattening phase. Four genetic groups of fatteners (40 pigs per group with equal amounts of male and female) were examined, namely (Landrace x Yorkshire) x Duroc-A ((LxY)xD-A), (Landrace x Yorkshire) x Duroc-B ((LxY)xD-B), (Landrace x Yorkshire) x Hampshire ((LxY)xH), and (Landrace x Yorkshire) x (Duroc x Piétrain) ((LxY)x(DxP)). The genetic groups (LxY)xD-A and (LxY)xD-B were differentiated by the origin of the paternal component from Poland (A) and from Denmark (B). Maintenance and nutrition conditions were the same for all animals throughout the rearing. Complete feeds were given according to age. The fatteners were slaughtered at approximately 100 kg live weight in autumn (in September and November) within four hours of transportation (approximately 280 km). Stunning was performed with an electric stunner (MIDAS, Stork RMS, The Netherlands) and INARCO constant voltage system. Animals were bled lying down in accordance with the technology applied at one of the leading meat plants in Mazowsze district in Poland. Lean meat content was determined 35 min. post mortem by ULTRA-FOM 300 (SFK-Technology), and hot carcass weight (HCW) was measured immediately afterwards (accuracy up to 0.1 kg). Then meat was chilled in a three-phase chilling tunnel (-10 °C for 15 min., then -15 °C for 25 min., and -5 °C for 40 min.) with air velocity of 3 m/s, and stored at 4 °C up to 24 hours post mortem. The genomic DNA was isolated from white blood cells, according to Kawasaki (1990). The RYR1C1843T polymorphic site was analysed with DNA test using the PCR/RFLP method, according to Fujii et al. (1991). The quality of samples of fresh meat (35 min. immediately after bleeding) and cooled meat (after 24 hours of chilling) was evaluated after slaughter on the longissimus lumborum (LL) muscle (after last rib). Acidity of the muscle tissue (pH) was measured directly in carcasses 35 min. (pH1), and in meat samples in 24 hours (pH24) and 48 hours (pH48) using a calibrated pistol pH-meter MASTER (Draminski, Olsztyn, Poland) with temperature compensation. Electrical conductivity (EC) was measured with a LF-Star electrical conductivity meter (Ingenieurburo Matthaus, Noblitz, Germany) after 2 hours (EC2) and 24 hours (EC24). Colour lightness of muscle tissue was measured after 24 hours (L*24) with a Minolta chroma meter (model CR 310, Minolta, Osaka, Japan) using D65 illuminant and 50 mm orifice. WHC was determined after 24 hours by the filter paper press method (Whatman 4 filter paper) according to Grau & Hamm method (1952) modified by Pohja & Ninivaara (1957). DL was determined according to Prange et al. (1977) after 48 hours (DL48), 96 hours (DL96), and 144 hours (DL144) at a storage temperature at 4 °C. Meat yield after the curing and thermal processing (72 °C) was expressed by the TY (technological yield) indicator according to Naveau et al. (1985). The water, dry matter, total protein and intramuscular fat contents (IMF) of the LL muscle were determined in accordance with procedures recommended by the AOAC, namely water and dry matter: method: 950.46; protein: method 968.06; IMF: method 991.36 (AOAC, 2000). Meat samples were cut from the LL muscle 35 min. post mortem, immersed immediately in tubes with 1 M HClO4, homogenized to inhibit glycolytic changes, and analysed for the value of glycolytic potential (GP) and its components, for example glycogen and lactate. The content of glycogen was determined by the enzymatic method, according to Dalrymple & Hamm (1973) and lactate according to Bergmeyer (1974). The GP was calculated as the sum of 2 [glycogen] + [lactate] according to Monin & Sellier (1985) and expressed as umol of lactic acid equivalent per g of fresh muscle. Rate of adenosine triphosphate (ATP) breakdown, expressed as R1 (IMP/ATP ratio), was determined 35 min. after slaughter on meat samples taken after the last rib, according to Honikel & Fischer (1977). 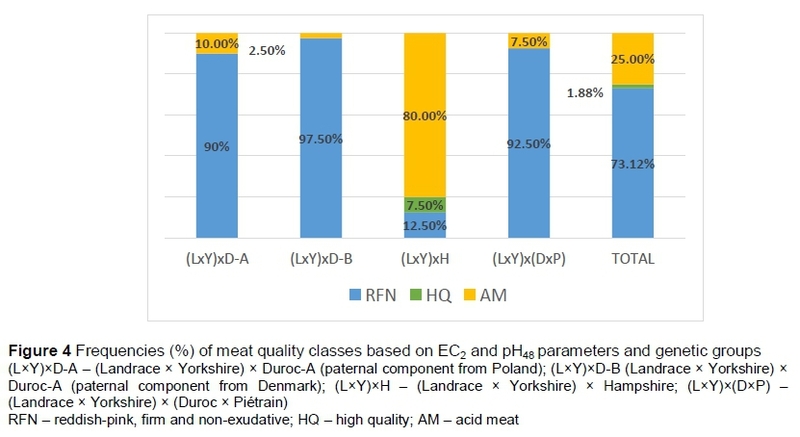 In the current study meat quality classes, for example RFN, high quality (HQ), PSE, AM and DFD, were evaluated based on diagnostic methods and their parameter threshold values accepted by Kocwin-Podsiadta et al. (2006) (Table 1). Additionally, the frequency of AM was evaluated based on two methods using pH48 parameter, for example pH1 (≥6.0) and pH48 (≥5.4) (Method III) and EC2 (≥4.5) and pH48 (≥5.4) (Method IV). Moreover, variability of pH was measured 48 hours post mortem and expressed as its minimal and maximal values and their arithmetical differences. The significance of differences between means was calculated using NIR test. In the current study, the average HCW and lean meat content were equal to 85.44 ± 3.30 kg and 56.51 ± 3.61%, respectively. Among the fatteners no RYR1TRYR1J genotypes were diagnosed. RYR1CRYR1T genotypes were diagnosed only in the (LxY)x(DxP) group in 30% of animals. The remaining groups were RYR1T allele free. The chemical composition, glycolytic-energetic determinants, meat quality and technological value traits are shown in Table 2. The most favourable values of glycolytic-energetic determinants, namely glycolytic potential (130.72 ± 21.57 and 135.38 ± 20.58 umol/g), and its components glycogen (45.40± 1 1.05 and 46.68 ± 11.04 umol/g), lactic acid (39.91 ± 9.27 and 42.03 ± 8.33 umol/g), pH1 (6.62 ± 0.17 and 6.60 ± 0.14), pH24 (5.71 ± 0.12 and 5.74 ± 0.09), and IMF content (2.06 ± 0.71% and 2.13 ± 0.73%) were obtained in (LxY)xD-A and (LxY)xD-B groups, respectively (Table 2). Analogous drift was observed for R1 (0.86 ± 0.05 and 0.90 ± 0.01) and EC2 (2.62 ± 0.58 and 1.92 ± 0.46 mS/cm) parameters (Table 3). The lowest drip loss (DL), measured in 48 (4.05 ± 1.67%), 96 (7.31 ± 2.01%), and 144 (9.38 ± 2,42%) hours post mortem, was obtained in (LxY)xD-B fatteners. The least favourable values of glycolytic-energetic determinants, namely glycolytic potential (177.39 ± 52.05 umol/g), glycogen (63.92 ± 25.91 umol/g), pH48(5.35 ± 0.09), DL144(12.63 ± 3.29), WHC (7.19 ± 1.21 cm2) and technological yield (TY) (89.57 ± 5.82%) were assessed in (LxY)xH group (Table 3). The values obtained for pH1, pH24 and EC2 parameters were typical of RFN meat, according to Kocwin-Podsiadta et al. (2006) (Table 1). 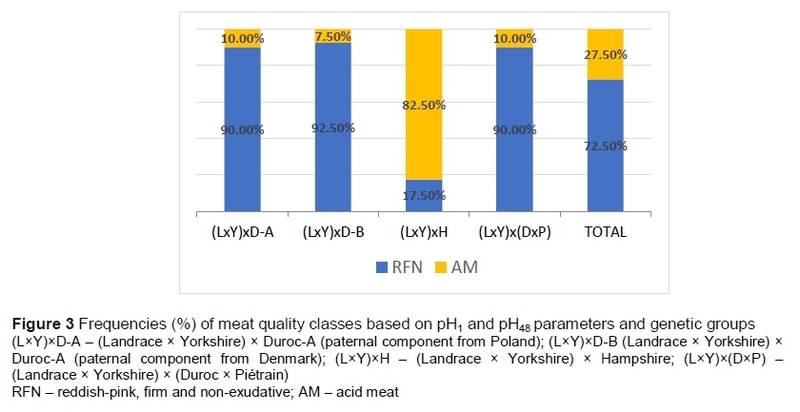 In the current study based on Method I, three meat quality classes were assessed, namely RFN, PSE, and AM, as 96.87%, 1.88% and 1.25%, respectively (Figure 1). PSE meat was obtained in (LxY)xD-A, (LxY)xD-B, and (LxY)x(DxP) fatteners, at 2.5% each (Figure 1). Acid meat was obtained only in (LxY)xH group at 5% (Figure 1). Based on Method II, four meat quality classes were diagnosed, namely RFN (37.5%), HQ (59.38%), PSE (1.87%), and AM (1.25%) (Figure 2). The percentages of AM and PSE in the current study and genetic groups were identical to those based on Method I. Based on Method I (and with the same threshold values that were used in this article) a similar frequency of RFN meat was noticed by Sieczkowska et al. (2009) in (LxY)xD and (LxY)xH fatteners at 100% and 95%, respectively. Przybylski et al. (2012) diagnosed almost 85% of RFN meat based on pH1 (≥6,0), pH3 (≥6,0) and pH24 (≥5,5) parameters in Naïma x P76 crossbreed. However, the low frequencies of AM obtained in this survey based on Method I and Method II parameters (Figure 1 and 2) do not correspond with high glycolytic potential (177.39 ± 52.05 umol/g) and its components, for example glycogen (63.92 ± 25.91 umol/g) and lactic acid (49.55 ± 12.29 umol/g), which were assessed in (LxY)xH group (Table 2). The Hampshire breed is related with AM, which is associated with RN- phenotype that causes low pHu value because of its high glycogen content during slaughter (Monin & Sellier, 1985). The low level of AM that was assessed based on diagnostic methods, including pH24 parameters, confirms that the time at which pHu is fully achieved has been extended, as reported by Zybert et al. (2008). According to the low level of AM in (LxY)xH group evaluated based on Method I and Method II (Figures 1 and 2) the need to modify them by changing pH24 parameter to pH48 parameter in Method III and Method IV became apparent. 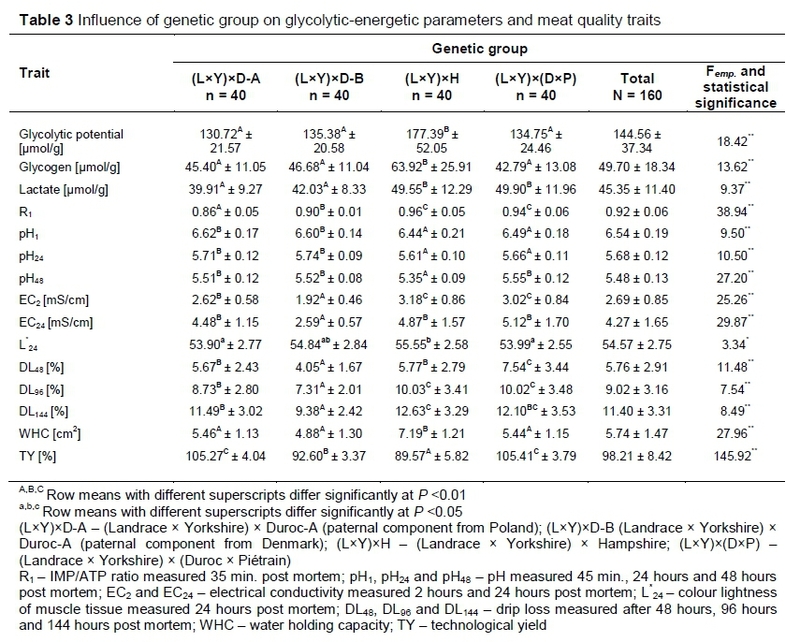 An additional motivation to evaluate meat quality based on pH48 hours was the wide variability obtained in the current study (5.24-5.90) and in the genetic groups, for example (LxY)xD-A (5.30-5.90), (LxY)xD-B (5.37-5.75), (LxY)xH (5.24-5.63), and (LxY)x(DxP) - (5.30-5.88)(Table 4). The use of the pH48 parameter caused major increases in AM frequency in (LxY)xH fatteners. Based on Method III and Method IV, 82.5% and 80% of AM in (LxY)xH group were obtained, respectively (Figure 3 and 4). Therefore, differences of AM level diagnosed between Method I and Method III and Method II and Method IV equals 77.5% and 75%, respectively. This high increase in AM level was probably caused by significant changes in post mortem metabolism that occurred in the meat ageing process as a consequence of modern pig breeding. The confirmation of these results is the high frequency (90%) of AM in (LxY)xH fatteners based on pH1, pH48 and R1 parameters (Sieczkowska et al., 2010). Moreover, AM was diagnosed in (LxY)xD-A, (LxY)xD-B, and (LxY)x(DxP) groups (Figure 3 and 4). The Duroc breed, which is regarded as contributing towards improved meat quality, is also seen as being RN- free (Houde et al., 2002). In this survey, however, 10%, 7.5% and 10% of AM were diagnosed based on Method III in (LxY)xD-A, (LxY)xD-B and (LxY)x(DxP), respectively (Figure 3). Slightly lower values of AM were obtained based on Method IV in these genetic groups, for example 10%, 2.5% and 7.5%, respectively (Figure 4). Altogether, in the current study, based on Method III and Method IV, 27.5% and 25% AM was obtained appropriately (Figures 3 and 4). Although the use of the pH48 parameter increased the frequency of AM in the fatteners, its usefulness for proper meat classification is low owing to the late time of measurement. According to the low frequency of AM in (L*Y)*H fatteners obtained in Method I and Method II pH measured 24 hours post mortem should not be regarded as ultimate pH (pHu) in pork meat quality evaluation. Diagnostic methods exploiting the pH48 parameter, for example Method III and Method IV, presented notably higher values of AM assessment in crossbreeds with Hampshire and Duroc. These changes should be taken into consideration by meat plants, because assessment of AM 48 hours after slaughter is too late for proper meat classification which should be carried out in the pre-rigor period. The solution might be the implementation of rapid diagnostic methods that are suitable for online usage such as vibrational spectroscopy. The most promising is Raman and Fourier infrared spectroscopy (Andersen et al., 2017). For example, according to Scheier et al. (2015) and Nache et al. (2016) Raman spectroscopy is fully applicable in the abattoir for pH monitoring. KT designed the study and analysed the data. HS revised the manuscript. AZ, EK-N and KA edited the layout and content of the manuscript. All authors approved the final manuscript after critical revision. The authors declare that there is no conflict of interest between them and other people or organizations that could inappropriately bias the results.